Video clip synopsis – Australian film and television production is competing in a globalised world with big international production companies who market their product effectively to the world market. Broadband MP4 content_bb.mp4 (10.8MB), suitable for iPods and computer downloads. 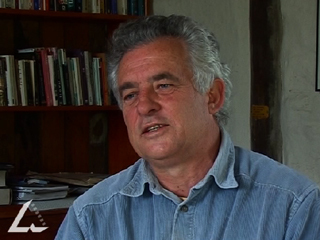 The interviews with Trevor Barr and Mac Gudgeon were recorded for the website From Wireless to Web, produced in 2005.
and political issues of significance to the students’ own lives. about particular events, issues and contexts to interpret texts. When students write information or argument texts, they make appropriate selections of information from a few sources and attempt to synthesise and organise these in a logical way. Students write imaginative texts in print and electronic mediums that contain personal, social and cultural ideas and issues related to their own lives and communities and their views of their expanding world. This resource is also relevant to Media Studies- Audiences, Representation, Media Conventions, the Drama Genre and Media Production. These are extracts only. Teachers and students should consult their state’s curriculum and learning programs. To meet Australian content quotas, commercial broadcasters devoted extra timeslots to news, current affairs and sports programs, plus numerous versions of new-format 'lifestyle’ programs. In the mid-1990s the commercial networks also renewed their commitment to producing serial dramas. Nine developed several successful dramas including Water Rats, Stingers and the high-rating series of telemovies Halifax FP, while Seven produced Blue Heelers and All Saints. Police and crime series Janus, Phoenix and Wildside went to air on the ABC. During this period television comedy was revitalised with sketch comedy programs such as The Big Gig, The Late Show and Fast Forward. The ABC also scored a major hit with Frontline, a spoof current affairs program. On Seven, Acropolis Now gently poked fun at ethnic communities in Australia’s dominant Anglo culture. In Trevor Barr’s view, what is the ‘worst thing that could happen’ to the Australian broadcast media, and why is it important to prevent this from happening? Explain why Mac Gudgeon is critical of Australian television network executives. Which Australian-produced TV programs of any type do you watch? Explain whether you would regard them as uniquely Australian, or derived, inspired or copied from overseas. Eg: What locations, characters, music and sound are embedded which can be described as distinctly Australian? Imagine that new regulations were suddenly introduced that ordered all Australian commercial TV channels to screen only Australian-made programs every day between 6am and midnight. In pairs, plan, draft, edit and proofread the script for a three-minute telephone conversation between two commercial TV network executives depicting their reactions, their feelings and thoughts, and what they think they will do about the situation. Rehearse then deliver a reading of your pair’s phone conversation script to the class. You should consider appropriate facial gesture, movement, posture and voice control. View trailers and promos for locally produced TV programs. Analyse the production techniques, content and style of promos for different genres: drama, news, comedy, reality TV etc. In groups design and script a short promo or trailer for a new program to appeal to your age group. Consider the symbols and style required to attract Australian teenagers. Create a DVD of your promo. Go to Screen Education for excellent articles and study guides focussing on all aspects of Australian television. Read Media 1 by Roger Dunscombe, Melinda Anastasios- Roberts, Juliet Francis, Karen Koch, George Lekatsas and Nick Ouchtomsky and Media 2 by Roger Dunscombe, Melinda Anastasios-Roberts, Kevin Tibaldi and Andrew Hyde. Heinemann Harcourt Education, Port Melbourne, 2007. Two recommended texts for classroom use for discussing representation and video production as well as many other key media concepts that relate to this clip. Go to the books online at Heinemann Media for more detail.